We still run across quite few doctors who still do not understand the value of marketing for new dental patients. We understand why… for most dentists the additional money that they are going to spend on marketing is money that they were planning to take home as salary. But the reality is: practices that are not marketing are not growing! Investment: the action or process of investing money for future profit or material result. Expense: the cost required for something; the money spent on something. An Investment is something that you want to do, because you want to see a return. An expense is something you have to do, because it is required. Do you see the difference? Approaching your dental marketing as an Expense is to approach it with a negative attitude. “I have to do this or else my Hygienist will quit.” Is that the right attitude? No it isn’t. Your attitude should be “I am choosing to invest this money in marketing because I want to increase production, get more new patients and take home more money at the end of the year!” As the famous personal wealth coach T. Harv Eker has always said, “What You Focus On Expands.” Do you want to focus on the positive outcomes or the negative? Disclaimer: Each practice is different. One practice could spend $30K per year on marketing and have completely different results than another practice spending the same amount. PPO vs. Fee-for-service, location, Team training, phone skills, etc. could all affect the success of a dental practice’s marketing plan. The more new patients you get, the more internal referral opportunities that you will have. 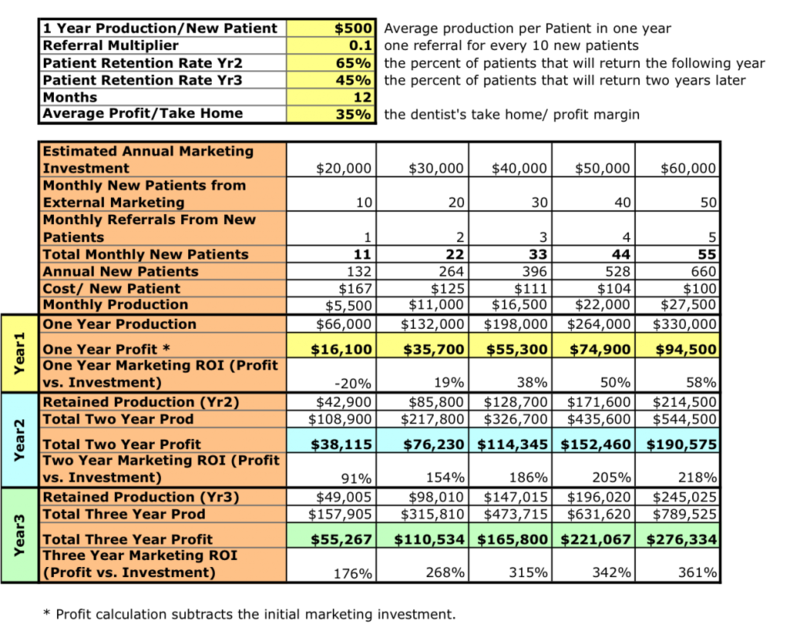 Since the initial investment in marketing those patients in Year1 does not have to be repeated, your return on your marketing dollars goes up significantly in Year2 and Year3. The more you spend (since it is correlated to the number of new patients you get), the more return you will get on your marketing dollars. Do you want help creating a marketing plan that will get you the returns that you want? Call us at (888) 412-8820 or contact us through our online form! Dental Startup Marketing Plans: Don’t Make These Common Mistakes! Not setting defined goals: Establish goals for what you want to achieve with your marketing. Set goals for the number of New Patients and the Production per New Patient that you want to generate. In other words, you could get hundreds of new patients by giving away dental exams, but what will the revenue for that look like? Not “cleaning your house”: If you were going to have first-time guests to your house, you would make sure things are in order, right? Well you need to do the same for your dental practice. Is there room on your schedule in the next 5 days to receive a new patient? Is your front desk team ready to take new patient phone calls and convert them into appointments? Are sending a welcome packet to your new patent before they come? Not diversifying your marketing plan: It is generally believed that it can take up to 7 contacts with a new potential patient before they make a decision on a healthcare provider. Therefore it is more important than ever that you utilize several marketing channels. As you can see above, there are many marketing channels that you can utilize! Not integrating your marketing plan: If your marketing is “integrated”, then it will have the same “look-and-feel” and messaging across channels, and all channels will work together. Not understanding the difference between Brand Advertising and Direct Advertising: Not every marketing channel you create will have a direct Return On Investment (ROI). Sometimes the value of a marketing piece is simply to get your name and brand out in the community, so that it will be more easily recognized in the future when patients are looking for a new dentist. Direct advertising is a direct solicitation (Direct Mail, Pay-per-Click ads, etc.) where you are requesting that a patient call you to set an appointment. Not educating potential patients: It is a huge mistake to assume that your patients know as much about dentistry as you do, because they don’t! Many dentists speak about their services as if they are talking to other dentists. Remember, you need to educate your patients on the benefits of your services. Not tracking success: While it is not always easy to track new patient referral sources, it is critically important. As the saying goes, “what you focus on expands.” Track your ROI by marketing channel and by calculating your production per new patient. Not reviewing your state’s Board of Dentistry Advertising Guidelines: Each state’s board has its own rules about what you can and cannot say in your advertising. Become familiar with these rules, and if you are working with an out-of-state marketing company, make sure they are familiar with these rules as well. Trying to do it all yourself: We cannot stress this enough. When you are starting your dental practice, you will have very little time to spare. We have seen several doctors who, after trying the do-it-yourself route with little success, end up having to bring in a professional marketing firm and pay them more than they would have if they had hired them in the first place. Not involving your team: Get your team involved and excited about promoting the practice. Enthusiasm is contagious, and if your team has it then it will rub off on your patients. Do you need help with your new dental practices marketing plan? Call us today or fill out our contact form. Don’t let missed opportunities hinder your new practice’s growth! We launch and manage full Dental Startup Marketing Packages for our clients. Below is an except from the Where to Begin section of our Guide to Purchasing a Dental Practice: A Step-by-Step Guide to Buying & Growing a Dental Practice, which can be purchased here. Future Revenue Streams are the most important factor for you to consider when buying a dental practice. A common mistake that doctors make when evaluating a practice to purchase is evaluating last year’s revenue instead of future revenue. The “big cases” performed by the previous dentist do not really represent future revenue, as the work has already been done. However, a steady stream of new patients into hygiene does represent future revenue streams, as they will be your opportunity for future treatment planning. One area to analyze is the percentage of production that is hygiene currently. If the number is high, there is a great opportunity for doctor production growth. In fact, maybe the current owner is referring out procedures that you can keep in house to increase doctor production. Just adding some new services could greatly increase the production from existing patients. Sometimes it is best to find a practice that is not doing the services today what you intend to do, versus a practice that is offering the exact same services that you will offer. For more insight into the right way to buy a dental practice, buy our Guide to Purchasing a Dental Practice: A Step-by-Step Guide to Buying & Growing a Dental Practice.